Inherent Vice: Will Thomas Pynchon's playlist feature in Johnny Greenwood's score? Joaquin Phoenix really came back from the edge, didn't he? After that whole bizarre performance act schtick just left people befuddled, the actor has steadily delivered one intriguing performance after another and now - like that other great reinvention, Matthew McConaughey - Phoenix is back to being one of our most beguiling actors. 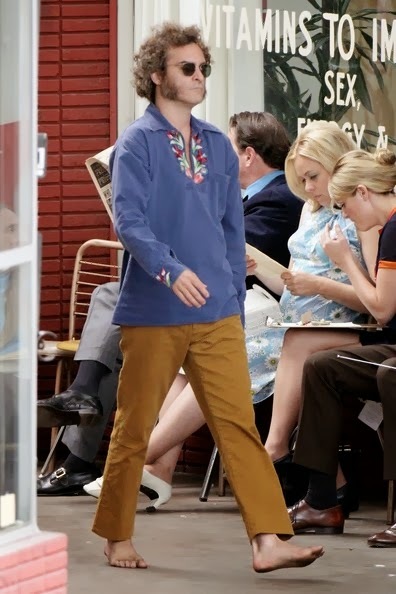 I'm still aglow from his performance in Spike Jonze' Her and just seeing Phoenix in Doc Sportello's retro garb in the production stills - plus the fact that it's set in a mythical beach town in my own back yard - has me all aflutter. I'll have to cool it until December 12th but, come on, take a look at those sideburns! I think I dated that guy! His name was George. 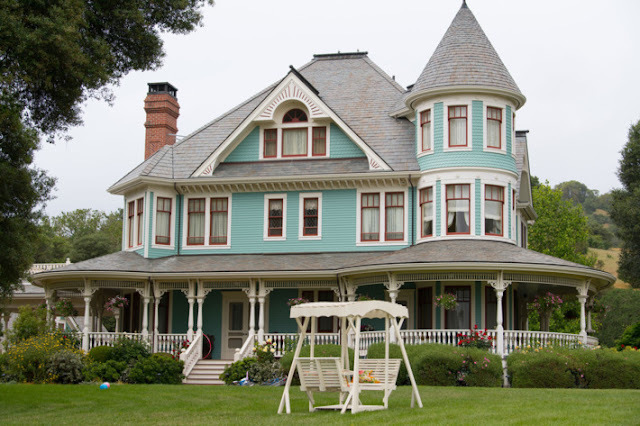 The cast of Inherent Vice includes Katherine Waterston as Doc's ex girlfriend, Shasta, Jena Malone and Owen Wilson as Hope and Coy Harlingen, with Reese Witherspoon (Penny), Josh Brolin (Bigfoot Bjornsen), Maya Rudolph (Petunia Leeway), Benicio Del Toro (Sauncho Smilax), and Sasha Pieterse as Japonica Fenway. 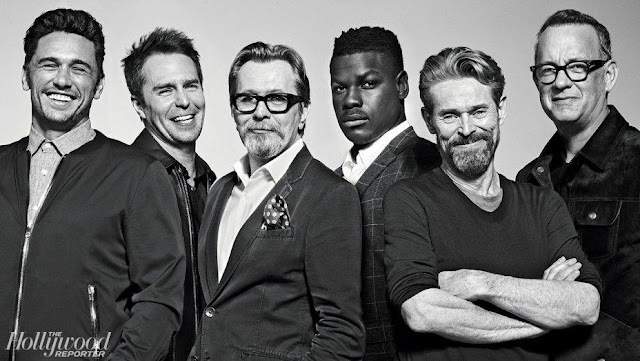 Will have to wait and see how the size of those roles play out in Paul Thomas Anderson's production. The December 12, 2014 release date puts the movie in prime time for awards qualification; the film has wrapped and there must be an early cut that looks promising. On the other hand, it's a Paul Thomas Anderson film with a mind-blowing cast; it was bound to get great placement before a single frame was shot. Haven't read Pynchon's Inherent Vice yet? It's clearly much easier going than Gravity's Rainbow, which we're hearing Anderson may adapt as well. Whaaat? I'm telling you right now, no way I'm going to try reading Gravity's Rainbow again. No way. 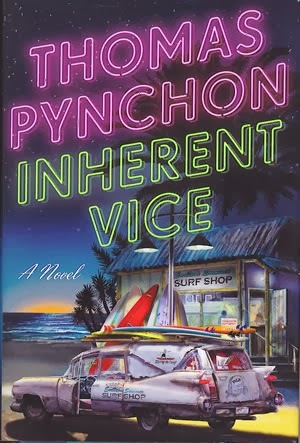 Check out the publisher's description for Inherent Vice and don't miss Pynchon's own playlist plus the book trailer below. Pynchon's voice has a cool gravel to it and while a lot of book trailers are simply goofy, this one is Groovy with a capital G. Listen and watch through to the ending which should make you laugh out loud. It did me anyway. Part noir, part psychedelic romp, all Thomas Pynchon- private eye Doc Sportello surfaces, occasionally, out of a marijuana haze to watch the end of an era. In this lively yarn, Thomas Pynchon, working in an unaccustomed genre that is at once exciting and accessible, provides a classic illustration of the principle that if you can remember the sixties, you weren't there. It's been a while since Doc Sportello has seen his ex- girlfriend. Suddenly she shows up with a story about a plot to kidnap a billionaire land developer whom she just happens to be in love with. It's the tail end of the psychedelic sixties in L.A., and Doc knows that "love" is another of those words going around at the moment, like "trip" or "groovy," except that this one usually leads to trouble. Undeniably one of the most influential writers at work today, Pynchon has penned another unforgettable book. Still listening? Look what I found over at Amazon; Doc's playlist courtesy of Thomas Pynchon! Who else is hoping that Johnny Greenwood, the composer and Radiohead/Weird Sisters guitarist that Anderson used to score both There Will Be Blood and The Master, brings some of these classics into the soundtrack? London's Royal Philharmonic Orchestra is on board; the thought of strings and The Beach Boys "God Only Knows" has my little heart swelling! Hop over to the link to hear some of the tracks. What would dope-smoking Doc think of our changing marijuana laws I wonder; would he still be living at the beach or would he have hightailed it to Colorado? Probably stay here and like everyone else rely on legal medical marijuana to ease the pain of a 'bad back'.